The pet food industry we know today was born in the late 1920’s. The muscle meat scraps, bones, entrails, and organ meats that were historically fed to dogs was replaced with prepackaged stock and grain based feeds because people needed those scrap meats and bones due to the economic depression. Before that, dogs ate a primarily raw meat diet. The grain based feeds were fortified with fertilizer meat meal, blood, and bone in order to add extra protein and calcium. This was the birth of the mega pet-food industry aligned with grain producers and meat processors profiting from actual waste produce because it couldn’t be used in the human food chain. Even though this new dog food was loaded with preservatives, saturated with colorants, heated to nutrient destroying temperatures, and formulated on a base of cereals; it was marketed as “scientific” and “healthy”. As the industry grew the pet food manufacturers began to reshape public perception and actively rewrite the scientific classification for dogs as “omnivores”; in spite of their carnivore teeth adapted for shearing flesh. To capture the market the pet food industry started to diligently sponsor nutrition lectures and literally fund veterinarian colleges in order to teach new veterinarians that dogs are “omnivores”. This false information campaign coupled with large profit margins for veterinarians who carried industry approved pet food kicked off the gradual corruption of our veterinary professionals. This was also the beginning of the pet health epidemic sweeping the world today. Genetically, dogs and wolves are 98.8% the same. Dogs and wolves are so genetically identical that they can breed together. All dogs are descended from grey wolves. Wolves don’t eat anything cooked, canned, or dried; and neither do feral dogs. As such, those things are unnatural for our pet dogs to eat as well. This carb-based unnatural diet is difficult for dogs to digest and promotes inflammation that becomes a chronic strain on the body. This leads to various autoimmune diseases, allergies, and cancers; yet these diseases are now falsely being labeled as “genetic”. As a result, the veterinary industry is booming and there’s no end in sight for disease causing kibble nor any deception too low for the multi-billion dollar pet food industry. Healthier skin & shinier coat • Cleaner teeth & healthier gums • Healthier immune system • Can drastically improve skin and yeast issues • Prevents serious disease like cancer & arthritis • Fewer health problems means fewer costly trip to the vet • More energy • More even-tempered • Longer lifespan • Not to mention way less messy and stinky poop! 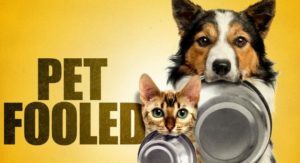 To take your dog’s health into your own hands and learn more about the benefits of a raw canine diet, please watch the illuminating documentary, Pet Fooled. WHY FEED DOGS A RAW DIET? If you want to transition your dog to a home made raw diet but don’t know how to begin, we can help. We offer raw feeding and nutritional consulting to help you eliminate the uncertainty and confusion. If you live in the Phoenix areas and you’re looking for a holistic approach to your dog’s veterinary care, look no further. Dr. Julie Mayer has been practicing veterinary medicine for over 20 years and she understands the benefits of raw feeding. Dr. Mayer has dedicated most of her career to holistic medicine and rehabilitation. You can purchase Small Batch, Primal and Stella and Chewy’s at Pet Choice Market off of 20th St. & Camelback. These will be the most convenient options. Make sure to get the frozen raw patties and not the freeze dried options. If you mention Zenergy you will receive 10% off.